Oxford Brookes University, School Of Technology, held its Graduation Ceremony on Thursday 25 June, 2009. To celebrate their achievements BCS Oxfordshire awarded two of the students prizes for outstanding effort. Hazleton, Michelle Katherine is awarded, by Sheila Lloyd Lyons, a £150 gift voucher and a certificate of merit. After gaining my degree in Information Systems and completing my project based on Green IT I have gone on to join 1E, www.1e.com, as a Graduate Project Manager assisting in the development of green software. 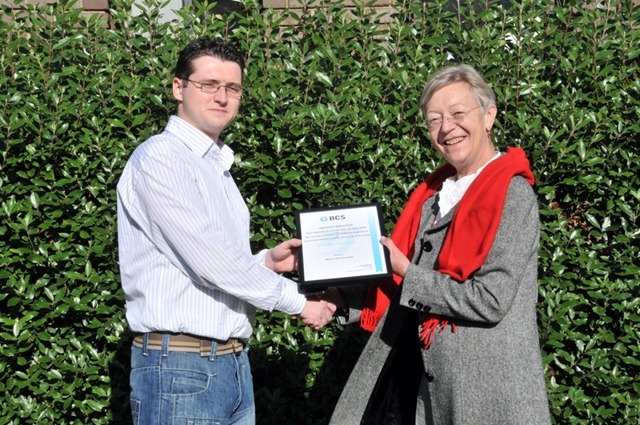 Koczorowski, Marcin is awarded a BCS student membership and a certificate of merit. 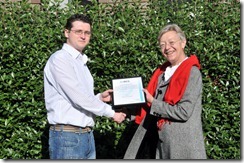 I am deeply honoured with this BSC Prize for the best results in computing subject , 2009. This award is the recognition of my achievements and you can only imagine how important it is to me. Over the last year, I have thoroughly enjoyed studying and developing my skills at Oxford Brookes University in the fields of Software Engineering and Intelligent Systems. However, the journey through this year was not plain and easy. Almost every subject comes with homework, project assignments, presentations and an exam. Apart from the loaded academic studies, I worked 4 days a week in order to pay for the accommodation. – I remember myself coming back from work late night and then studying and doing assignments till morning to meet deadlines. I am trying to be innovative in every solution I provide, in every project I work on. This involves a lot of research and facing a lot of challenges. Challenges, the overcoming of which I found so exciting and victorious! I can hardly remember assignment or a project which I can call unnecessary today. – Certainly, I’ve been fortunate to have found the occupation I love. Software developing was always my passion. This is what I do, what I understand. Oxford Bookes is an excellent university where I can develop and share my passion. I can’t describe my happiness and enjoyment today, I would like to thank Professor William Clocksin, Mrs. Shivvy Massingham for spotting me among other students, and Mrs. Sheila Lloyd Lyons, who was so kind and visit me in person. It has been so inspiring! I wish best luck to all students in upcoming academic year. Do your best and you will certainly be rewarded.